This is an amazing freeform of rhodochrosite from a new find in Peru and I think you’ll agree that it’s totally unique! The color is deep and rich red with orange overtones and gel-like with bands of color and nice internal detail. At the narrow end, there is a “snowman” like figure with the bands radiating from there. You will also see pieces of black manganese! She is nothing short of sublime and will be a real meditation favorite! She is 2.6 oz and 1.1” by 1.3” by 0.85”. 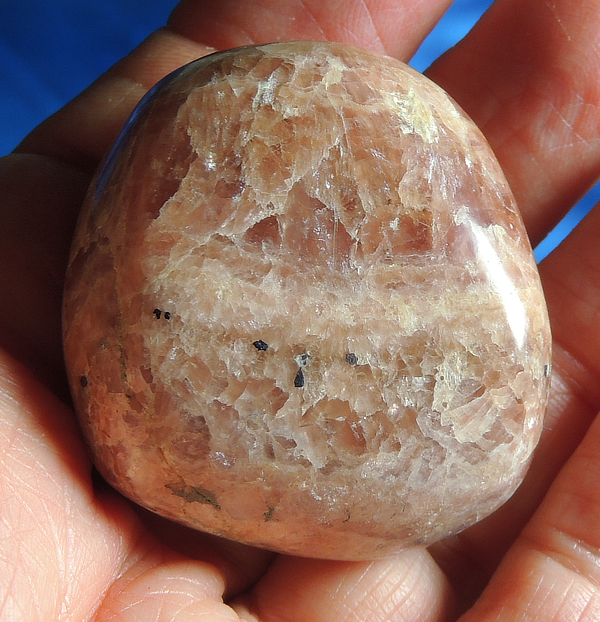 Rhodochrosite has been called the stone of love and balance. When my husband and I got married, we each carried a slice of rhodochrosite with us to symbolize the love we shared and the balance we wanted. It was a great choice and we still have those rhodochrosite slices! The energies are so soft and warming and calming, all at once. The coral-pink color allows the expression of the heart with the passion of the physical. They give you the confidence to do and BE what you truly love! She is a wonderful stone as the center for a heart grid or an addition to a loving altar!